Food, warm weather, and good company.. what more could you ask for? Don’t miss out on summertime cookouts just for fear of breaking your clean-eating streak. Try this simple recipe swap to make sure you don’t miss out on the summertime fun. 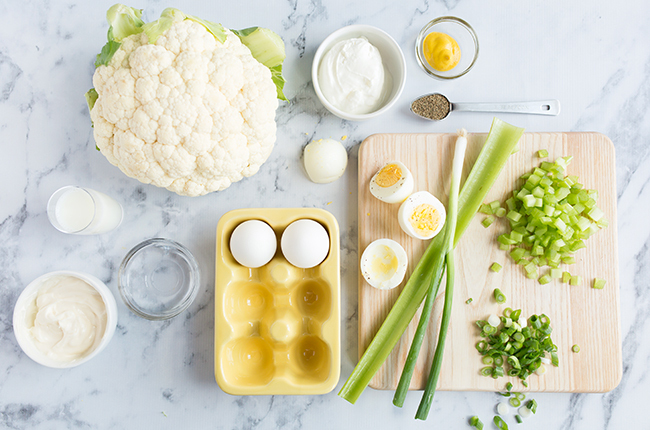 Place coarsely chopped cauliflower in a microwave safe dish; add 1/4 cup of water and cover dish. Microwave on high for 3 minutes. Remove from microwave and allow cauliflower to sit for about 5 minutes. Cauliflower will still be slightly crunchy. Drain off excess liquid. I put paper towels in a strainer and let the liquids drain for about 5 minutes. Add eggs, celery and onion; toss. Add Greek yogurt (about 1/2 cup) and a couple of tablespoons of mustard. Add seasoning to taste and stir to combine, if to dry add additional mayo. NOTE: I used about 1/8 tsp dill weed in the salad and then sprinkled a very small amount on top.